Happy Bloggers Challenge Friday! Thanks to those who played along with the Christmas Stockings Challenge, the challenge this week is Holiday Ornaments. I like to create and give ornaments as gifts at Christmastime, and thought that the Coffee Box SVG File from SVG Cuts Santa's Surprises SVG Kit, would be perfect for housing a single ornament. Using the Silhouette Cameo, I resized the file pieces to fit the ornament I was using and cut the pieces from Bo Bunny pattern paper. To decorate the ornament I used the eBrush and a Gold Sharpie Marker to spray the inside, then cut the Ornament Design from SVG Cuts Santa's Surprises SVG Kit from White Vinyl. To add color to the vinyl, I used the eBrush and a Silver Sharpie Marker, then used transfer tape to adhere the vinyl to the ornament. To embellish, I added Silver Gems to the center and points. You can see it fits nicely in the box. 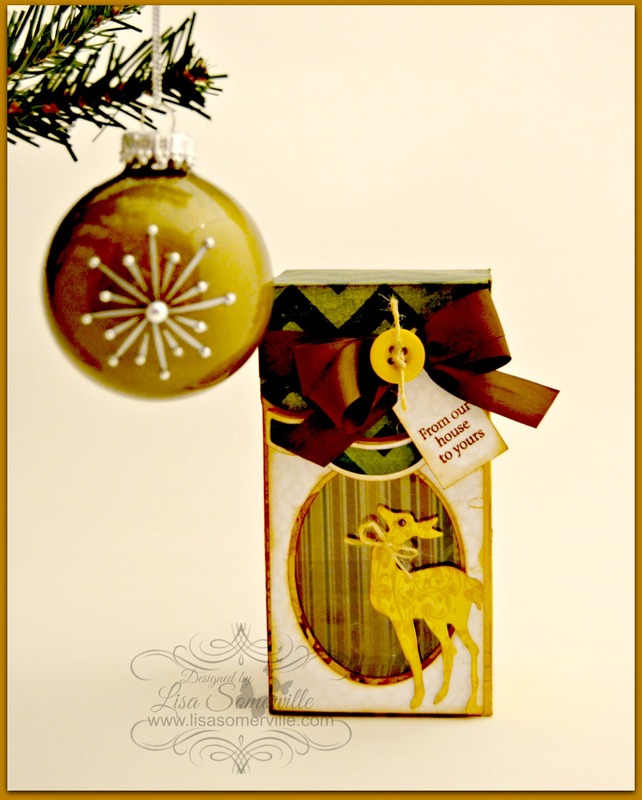 To embellish the box, I added Vintage Brown Seam Binding, a button tied with twine, and a reindeer that was die cut from scraps of the pattern paper. 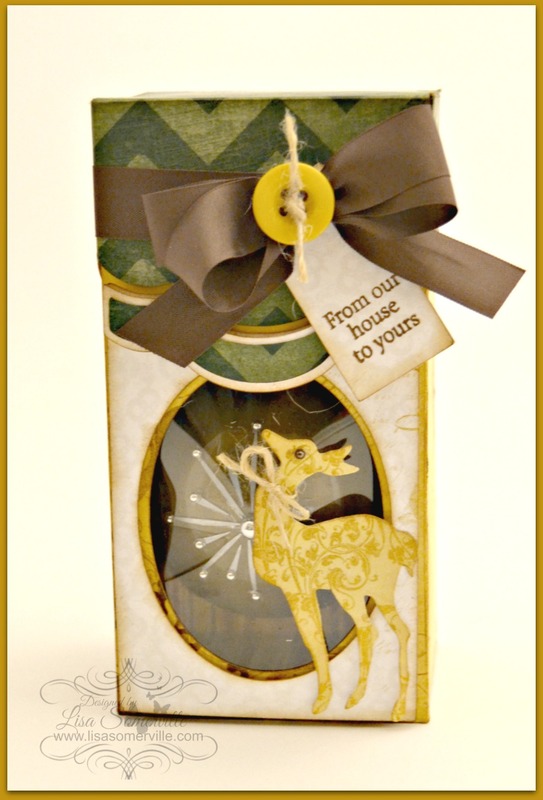 The tag was stamped in Coffee Archival using Our Daily Bread Designs Mini Tag Sentiments. If you'd like to play along with this weeks Bloggers Challenge, please link back to this post on your blog and mention you created your card for the Bloggers Challenge Holiday Ornaments Challenge. Please add your link using the Link Tool below, your link should be a direct link to your Bloggers Challenge Post, use your name as the Title. Please do not link to cards that were created prior to the challenge date. Entries not linking properly, or backlinked will be removed. If you have the captcha enabled on your blog, please consider turning it off, as it makes it so much easier to leave comments. Great gift for some lucky person. Simply WOW, Lisa!! What a lovely gift--the ornament is beautiful!! A keepsake ornament for years to come! !